Lately I’ve been feeling a lot of different emotions when it comes to Star Wars and what it means to me, as well as what it means to my fellow fans and friends. I’ve tried to step up my game lately when it comes to the twitter community because I’m realizing how many incredible people there are in Star Wars fandom, many of whom I can’t wait to meet at SWCC. Social media can be a mixture of good and bad, but I’ve loved getting to know different people on twitter, and tend to gravitate to those people who are real and authentic, they express what they love, what frustrates them, they encourage, and they share when they’re down and feeling alone. Why do we do that? Why do we all put ourselves out there to the great unknown and be vulnerable and real? I think a lot of it has to do with the fact that we can’t do this alone. This life was not meant to be done alone. But let’s, for the sake of my point, take a look at what it would have been like had Ben actually told Luke to go it alone. Luke would wander into the Mos Eisley Cantina, looking for someone to fly him to Alderaan, but before he’d get the chance to even meet a pilot, he’d be killed by Ponda Baba and Doctor Evazen, because Ben wouldn’t have been there with his lightsaber to step in and save him from the local thugs. But again, for my point, let’s say he does survive his encounter, and then just so happens to chat it up with Chewbacca and secure a ride to Alderaan. What would have happened had Han and Chewbacca just dropped Luke off at the Death Star and took to their escape as quickly as they could. I realize that doesn’t make sense as a plot line or even as a possibility due to so many other factors, but I think you’re all following my point. Luke could not have done this journey on his own. I think that Luke realizes this more than even the Jedi Masters Yoda and Obi Wan, because he not only knows the role that his friends have played in his journey thus far, but because of that role, because of all they’ve been through together, because he knows that they have his back and he has their’s, he is not willing to sacrifice Han and Leia to whatever doom awaits them on Cloud City in the Empire Strikes Back. Both Yoda and Obi Wan try to dissuade him from leaving, saying he must complete his training before he confronts Vader and the power of the Dark Side. Yet Luke puts aside the sometimes flawed teachings of the Jedi, knowing what his friends have meant to him, and goes on to Cloud City in spite of his training. 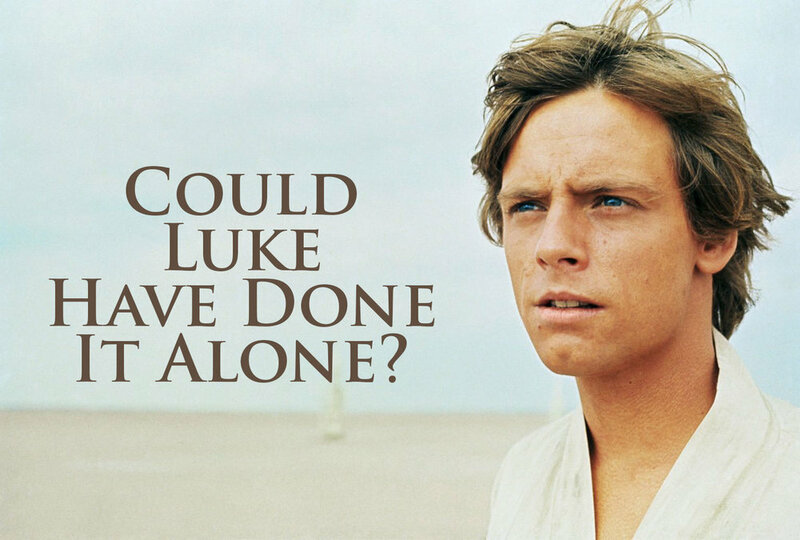 My examples can go on and on, and before anyone @‘s me about how Luke did end up confronting Vader and the Emperor by himself, my point is, in his journey of life, in all our journey’s, we are not alone! Sure, there are times when we need to do things on our own, or even times when we feel completely isolated, and the only way to get through it is to find that inner strength to keep us going. However, I know for myself, that inner strength is a lot easier to find and muster up when I have the support and encouragement from the people I share life with. Even in our beloved world of Star Wars, the characters we know and love so much were never on their own. Luke was not alone. Social media, with all it’s flaws and dangers still has so much good to offer. So many of us have found a community of friends that support and encourage us, and remind us, we are in this together. Many fans on Twitter that are attending SWCC have been counting down the months, weeks and days until it’s finally here. It’s gonna be an amazing week of meeting so many friends, getting into panels, buying all sort of limited edition swag, and just having a great time with a wonderful collective of fans. What an incredible event we get to share in, based entirely on this farm boy’s journey through a galaxy far, far away; a journey he did not do alone! We would love to hear your thoughts – you can find us on The Twitter at unmistakablysw!